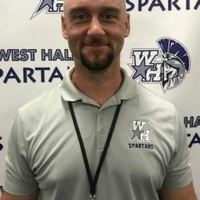 Coach Wagner is entering his first season of being the Spartans athletic director at West Hall. Prior to that, Coach Wagner was the Defensive Coordinator for the Spartans. In his career, he has served as a Head Football Coach for 7 years and a Defensive Coordinator for 17 years. He has coached at Maryville College (TN), Lenoir City High School (TN), Elbert County High School, Apalachee High School, Winder-Barrow High School, and most recently at Flowery Branch High School. Coach Wagner was a 4 year letter man at Maryville College where he played linebacker. He majored in Chemistry with Teacher Licensure and earned a BA Degree. He also has a MA (Tennessee Tech University) and an EDS (Lincoln Memorial University) in Curriculum and Instruction. Coach Wagner has 3 children (Mackenzie 16 years old, Willy Jack 14 years old, Zac 11 years old).